In my 2011 quest to only eat meat which I have hunted or gathered myself, I’ve learned a lot. Most people ask me “how” I do it, so I thought I would share a bit more on the actual tasks of finding the food. Well there is a lot to cover in this subject possibly more than one blog would allow but all the hunting so far falls into two categories; shooting and trapping. The shooting has all been in woodland, only for species authorised on an open licence and the weapon is a .22 break barrel air rifle. The traditional approach would have been bow and arrow but hunting with these traditional tools is illegal. The range and level of accuracy of an air rifle does mean that more skill is required in stalking your prey and indeed the size of game that can be effectively hunted is also limited but that’s why I like it. Archery skills aside I think it has similar limits in its use to a bow and arrow. If you can stalk well enough, and get close enough to take a head or heart and lung shot then it’s an effective means of humanely dispatching animals. If your stalking skills aren’t up to much then you are never going to get a shot. Animals taken so far have been 1 rabbit, 2 wood pigeons and 3 grey squirrels. Trapping is a game of patience. It’s a percentage game where in a new area you probably need to set 20 traps for every one animal you might catch and of course there are many regulations and concerns about the types of trap you can (or should) use and how to use them. 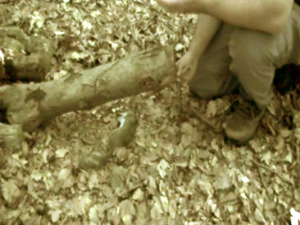 I practice the use of primitive traps, made from all natural materials and I usually favour one of two designs. One is a live capture trap suitable for birds and it is effective for pigeons and crows depending on how it is baited. The other is a killing type trap that is effective for use with squirrels or rat’s. All traps should be set so they offer no harm to non targeted species and must be checked regularly at least every 24 hours. As I say there are far too many details about trapping to go into here, perhaps another blog on trapping in the future. So far trapping has provided….1 grey squirrel! My traps are only set for around 12 hours maximum before I leave the woods and so dismantle the traps and this is much less effective than leaving them set in place and checking them regularly. So what about the last option? 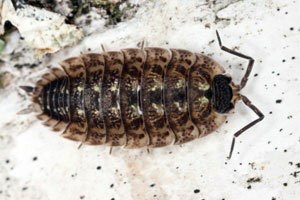 Two main sources of gathering meat the first is an easy source…arthropods (insects, crustaceans, myriapods & spiders). Woodlice (crustaceans) are an easy to gather, nutritious source of protein and once you realise they are just 'Land Prawns' they are easy to stomach and actually taste just like Prawns. You do need to collect quiet a few for a meal but for me, better a handful of woodlice than a battery farmed piece of chicken. The other gathering option is the meat that other people (like you lovely readers), kill and leave at the roadside. Road kill has developed a bit of a name for itself and many people are aware of it as a source of food, but perhaps lack the confidence to know what to do with it. Is it safe, what if it’s been dead a long time, what if flies have laid eggs on it, isn’t it a bit yucky with all it’s guts etc? They are all good questions. Before we go on to look at the answers it is worth remembering a few points. All meat you eat gets killed, has disgusting squishy bits, has the potential to be unsafe to eat (people who never eat road kill still get food poisoning) and may have been dead a long time. Any road kill no matter how squashed and messy can be made safe to eat with enough preparation and with enough cooking but it can’t all be made to taste great. You just need to ask is it worth it? Hi Steve, I agree snares are a very effective method. When I was growing up in Ireland my Dad and I would snare a few rabbits now and again. In the location where I have permissions I chose not to set snares. There are a lot of deer in the wood and the last thing I want would be to find a distressed deer with a foot stuck in a snare, but if the location was right then I agree snares would be useful. In the woods that I go to, I can most accurately target grey squirrel and wood pigeon. With enclosed deadfall or spring snap traps I can gaurantee only greys or rats would be killed and with live capture bird traps if not targetted species were trapped theycould be released without harm. For me responsible trapping starts with assessing the most suitable type not just to ensure capture but to avoid undesired captures. I have set and had good success with coke bottle minnow traps in the past. As you rightly said they are very easy and effective and the “red wool” is a real top tip. Have you tried any snares to go with your traps? I have had several goes with dead fall and line traps and snares and IMHO snares are more efficient but you need to visit them regularly (a pair of binoculars is a really good way of checking snares). I have also used fish traps and they are a really low calorie expenditure way of getting good protein – a bit of red wool and a coke bottle will get you a good meal. I have never tried a crayfish trap but have heard they are really efficient and a good way of getting rid of the American invader! Thanks for the comments Simon, you make a few good points. I agree that calorie expendature to calorie gain is an absolutely key in “survival”. I have eaten worms (cooked and raw) and cooked they are certainly good survival food. Slugs and snails can also be good but there is a real risk if they are not thoroughly purged before consumption. Slugs and snail will both regularly feed on fungi that are toxic to humans and cooking may not remove all the toxins from them. A few days minimum (up to a week)of containing the slugs and snail and allowing them to only feed on plants that are edible to humans will sort out that hazard. The bird egg thing I have also been taught. As you say completely illegal so NEVER to be done, but if you want a wild bird egg that you can crack into a pan and make an omlette to keep you alive (survival) you are going to be dissapointed. There will only be about 2 weeks in a year when you could find a wild bird egg in that condition so it’s theoretically good but in practice has a very limited possibility. I haven’t had badger yet (buy I am looking) it is supposed to taste very good although is a very heavily scented meat when raw. Carrion is fine but should as high a temperature as possible (deep fried is recommended) or thinly sliced and seared on a hot fire until crispy. I’ve had crow, I wouldn’t call it flavoursome but I would certainly not hesitate to eat it. I think your words on skip diving are spot on, in fact society throws away so much food that the easiest place in the world to “survive” would be outside a fast food restaurant or behind a supermarket. I used to be in the Army and I have done a fair bit of survival training in various terrain and climates around the world. One of the basic land survival principles is to never expend a lot of effort in finding/hunting/chasing for just a small meal. One of the most effective methods of feeding yourself is to place plastic sheeting on the ground, go to sleep and in the morning peel it back to find a nutritious and appetising meal of slugs, snails and worms. I liked the expression “land prawns”! Anything unpalatable or disgusting can be cut up into small pieces and fried with a birds egg (definitely illegal but we are talking about survival! )- fried worms taste like bacon. Lizards and snakes taste like chicken. You can usually find a meal in just 100 metres of British hedgerow. I never tried road kill but it makes complete sense. Just meat killed in a different way. I would draw the line at badger,pets, carrion eating birds and rabbits with myxomatosis. I hate waste in society but haven’t tried “skip diving” round the back of the supermarket. Its just psychological. Tuck in!